Do you own an C4 Corvette with a winking problem? What I am referring to is the common headlight motor failure in 1984-1987 Corvettes. The problem is that, straight from the factory, the headlight motors use nylon gears to rotate the Corvette headlight assembly. With the weight of the headlight assembly, the nylon gears eventually strip where they come in contact with the metal worm gear. Chevrolet recognized this problem and redesigned the motor for the 1988 Corvette. Now Zip Corvette Parts has come up with a solution to this common problem with their new bronze headlight gears. The replacement procedure is not very difficult and can be done in about 45 minutes per side. Once the gears are replaced, your headlight motors will operate as they were designed and you’ll be able to expect many years of reliable service. To replace the gears, you will need 1/4-inch ratchet with a long extension, 13mm deep well socket, 10mm socket, Phillips screwdriver, hammer, brass punch, needle nose pliers and some silicone sealant. Once you have completed this project, you will be able to drive your Corvette again with the assurance that it will not wink at anyone again. 01: After unplugging the connector (with green, white, and gray wires) near the front side marker light, locate the gray knob at the bottom of the Corvette headlight motor. Remove the locking strap from the knob and turn the knob until the headlight is in a position to where you can remove the side screw from housing cover. 02: This is the side screw we are going to remove. This is a special screw so make sure you do not misplace it. 03: With the side screws out, remove the front Torx screws, then separate the Corvette headlight cover from the headlight housing. Remember to lay it on something soft because you do not want to scratch the paint. 04: Looking into the headlight housing towards the location of the headlight motor, you will see a retaining nut. Lubricate it with WD-40 before removing it with a 1/4-inch ratchet with a long extension and 13mm deep well socket. 05: Locate the metal wire retaining clip located in the corner of the headlight frame. 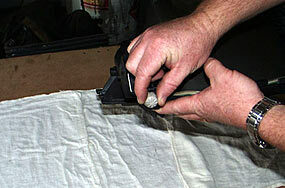 You need to carefully remove the clip so that it does not go shooting off somewhere in your garage. To remove it, gently pry up on the small prongs and the clip will slide off. Once the clip is off, remove the headlight motor wires from the headlight frame. 06: If you look at the side of the headlight motor, you will notice a small bracket that bolts to the headlight frame and the hood hinge. Unbolt the 13mm carriage bolt between the bracket and the hood hinge, then remove all of the 10mm bolts that hold the headlight motor to the headlight frame. Then you can remove the motor. 07: With your Corvette’s headlight motor out, remove the wire clip from the locking knob. Just pull it out of the housing. 08: Use a Phillips screwdriver to remove the screws that hold the housing together. Silicone sealer was used at the factory to keep water out, so you may need to use a small putty knife to separate the housing. 09: This is what you’ll see once you have separated the housings. Notice the small washers on each of the gear shafts – you need to make sure you remember to reinstall these. 10: Using a pair of needle nose pliers, pull the main (large) gear out of the motor housing, then pull up on the metal gear and it will slip right out. Remember how this gear is assembled because you need to reassemble the bronze gear the same way. If you happen to receive a bronze gear without the rubber pads in it, just reuse your original ones. Once you have the gear assembled, apply a liberal amount of lithium grease to the entire gear and reinstall it into the motor housing. 11: For the small gear, you will need to lock the shaft into a vise. Then use a brass punch and hammer to remove the pin that locks into the gear. of the old plastic one. Once the gear is in place, put it back into the vise and reinstall the pin. 13: These are the new gears we used from Zip Corvette Parts, part numbers HDL-233 and HDL-234. 14: In a side-by-side comparison, you can see the difference between the bronze gear (left) and the original nylon gear. The new bronze gears won’t wear out like the originals. 15: This is what your headlight motor should look like after you have the new gears installed. 16: Before bolting the two halves back together, you will need to apply a small amount of silicone sealant to one of the halves to prevent water from shorting out the motors. Then reassemble everything in the opposite order that you removed it.